This post is the third in a five-part series (I. Projection, II. Base Maps, III. Color Selection, IV. Symbology, and V. Legends) which will look at various GIS tools and methodologies utilized by Stratasan. In this post we will discuss the colors and color schemes we use in our maps at Stratasan. Color is an important part of any map. It helps the map reader understand what is being presented, helps separate and organize different attributes, and draws the reader into the cartographic presentation. We use various color schemes for our maps so map readers can easily identify and understand map variables without colors being confusing (or so bright that you would need sunglasses to look at them). For polygon features with values we use shades of red or blue. We use red because it is the color the human eye can most easily differentiate various shades of. It allows people to see the various values easily and comprehend them on the map. Blue also works well because it is a neutral color that has many of the same properties as the red color scheme. The color of point data is also very important. We use colors that are easily distinguishable from one another (especially if they are going to be displayed together on the same map). Examples of point colors we use would include: bright red, royal blue, orange, leaf green, golden-yellow, and a deep violet. These colors look good together (or separate) on a map without drowning out base layers beneath them or distracting from other points on the map. That being said, there are colors we avoiding using on point layers. These would include: bright colors of any kind, colors that are combinations of two primary colors (such as yellow green, or red-orange), and any gray-scale color schemes (When displayed on a map they become confusing and overly complicated). 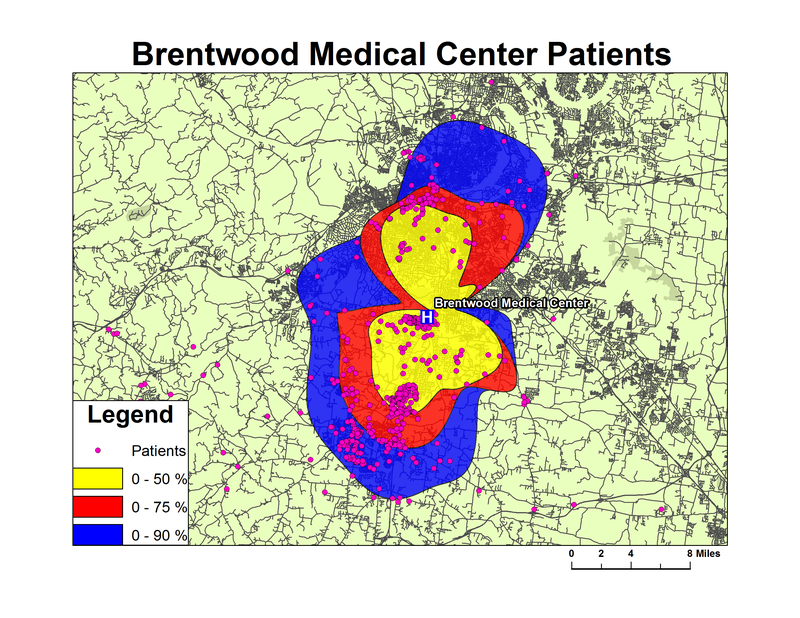 To see examples of point colors like the ones described you can order a Development Brief, Market Brief, or a Community Health Needs Assessment (Which you can see on the Stratasan website)! This is an example of a map with a good color scheme. The white background helps the colors in both the points and the trade polygon to be seen easily. The red color of the trade area is not overwhelming on the eyes and easy to understand. The gold points representing patients pop out of the map, are easy to see, and it does not distract the viewer from other parts of the map. 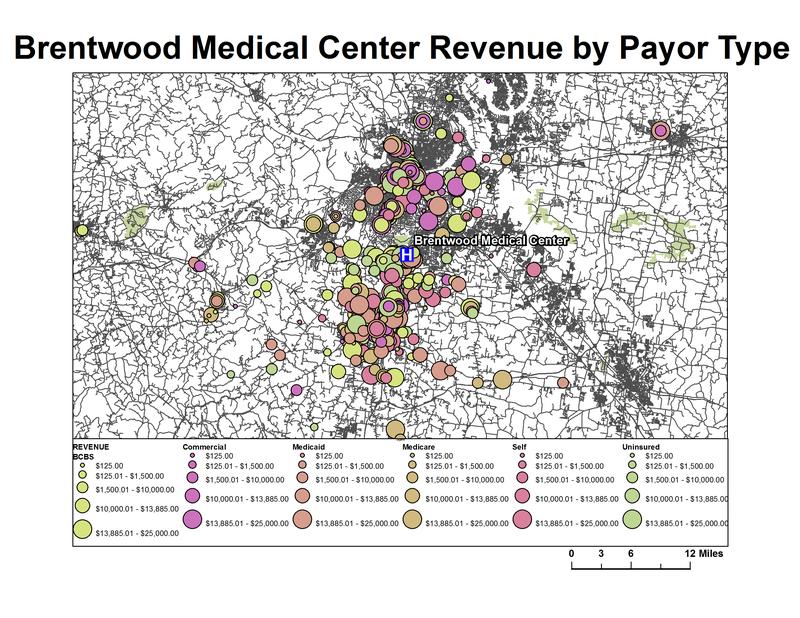 This map is a great example of a bad color scheme. The olive background absorbs the point layer and conflicts with the trade area polygon. The trade polygon itself is bright and distracts the map viewer from the rest of the map. And finally, the ginger pink color of the patient points are distracting, conflict with the 0-75% area of the polygon, and blend into the streets layer and the olive background. 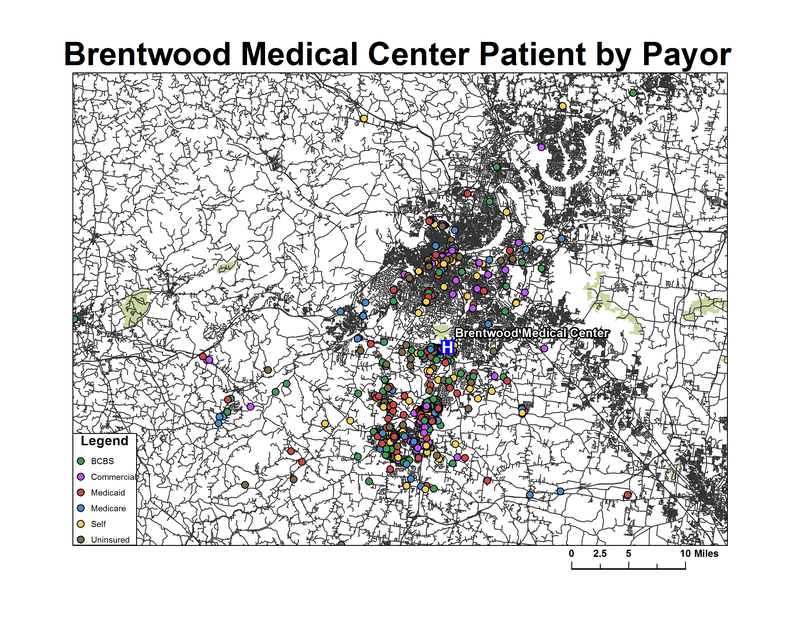 The 'Patient by Payor' map above is a good example of using multi-colored points. They are large enough to see, pop out from the white background, and have a color scheme that makes each payor type easily identifiable. 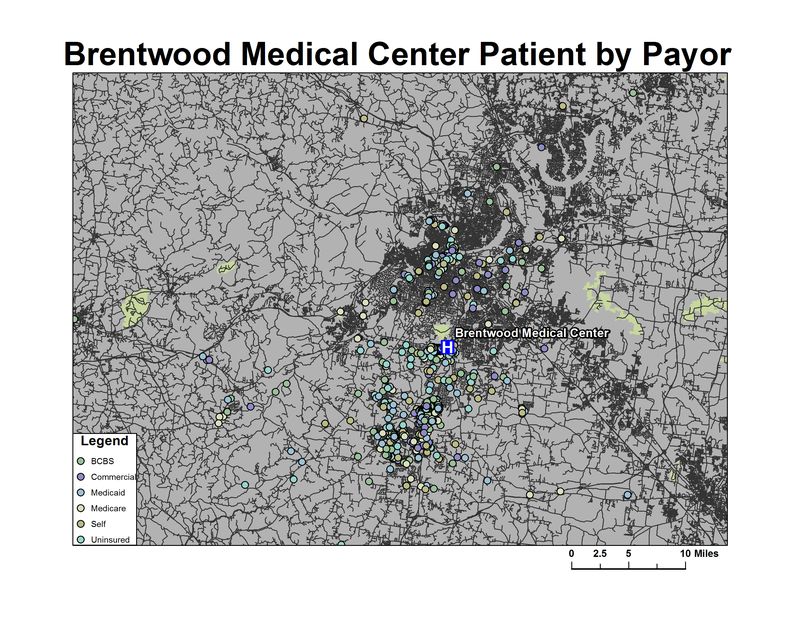 This version of the same map above is an example of a bad color scheme: they blend together easily (in this case light tans, greens, and blues) and are hard to see apart from the dark gray background. 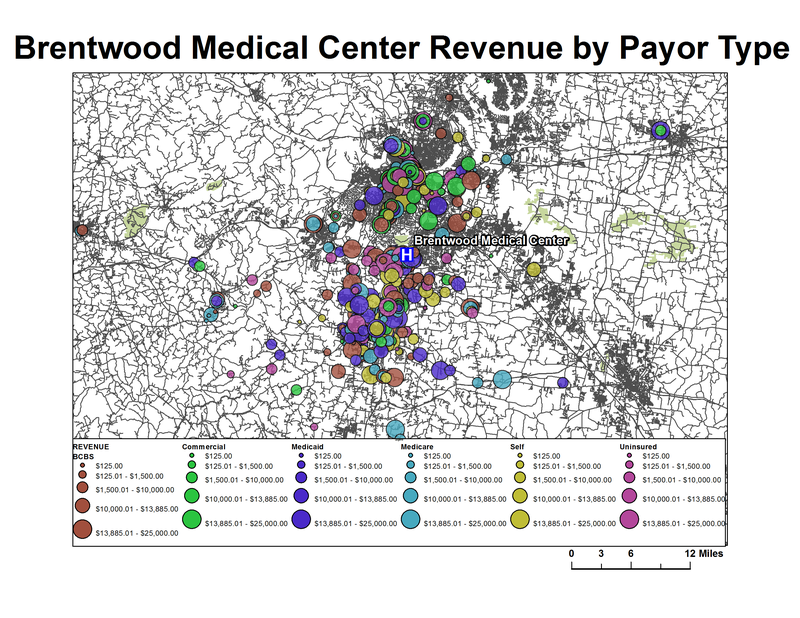 This 'Revenue by Payor Type' map is a good example of color and proportional symbols on a map. The map reader can tell the colors apart from one another easily and they are 30% transparent, so the overlap of circles, streets, and landmarks underneath the circles can still be identified. In this version of the same map, the circles are not transparent so they block a large portion of the map. The person viewing the map is unable to see the landscape, streets, or overlap underneath the circles. The color scheme also makes it hard to tell the payor types apart. The light reds, oranges, tans, and greens blend into each other and make it look like there are three variables, instead of the six that are present on the map. In the world of GIS and mapping there are almost unlimited options when it comes to the color schemes that are utilized in maps. The aforementioned color preferences are the best, but like most things in life: everyone is entitled to their own opinion. What we can tell you is that all the data and information you want can be put on a map, but if no one can read or interpret it, what's the point? The color schemes we use at Stratasan are carefully chosen to make our maps the most readable and attractive as possible. This allows our customers to easily read and understand our maps, as well as share them with others throughout their organizational networks.